Neecha Nagar (Hindi: नीचा नगर; English: Lowly City) is a 1946 Hindi film directed by Chetan Anand. Written by Khwaja Ahmad Abbas and Hayatullah Ansari , it was a pioneering effort in social realism in Indian cinema and paved the way for many such 'parallel cinema' films by other directors, many of them written by Abbas. It starred Chetan Anand's wife Uma Anand, Rafiq Ahmed, Kamini Kaushal, Rafi Peer and Zohra Sehgal. 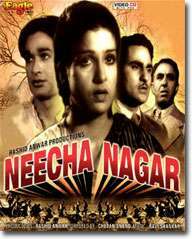 Neecha Nagar became the first Indian film to gain recognition at the Cannes Film Festival, after it shared the Grand Prix du Festival International du Film (Best Film) award at the first Cannes Film Festival in 1946. It was based on a Hindi story, Neecha Nagar, written by Hayatullah Ansari, which in turn was inspired by Russian writer Maxim Gorky’s Lower Depths. It took an expressionist look at the gulf between the rich and poor in society. Neecha Nagar is the debut film of actress Kamini Kaushal and for Ravi Shankar as a music director. ↑ History will never forget Chetan Anand 13 June 2007. ↑ Maker of innovative, meaningful movies The Hindu, 15 June 2007.